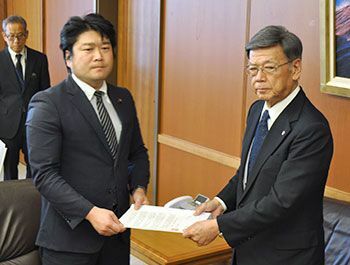 Following the accident in which a window frame fell off a U.S. helicopter and the grounds of Futenma Daini Elementary School in Ginowan City, on the afternoon of December 14, Governor Takeshi Onaga visited Minister of Defense Tomohiro Yamamoto. Governor Onaga went over the series of crashes and accidents of U.S. military aircrafts in the last year and directly appealed to the Minister to suspend flights for all U.S. military aircrafts at all Okinawa U.S. military bases. Governor Onaga pointed out that it is a “huge shock to the Okinawan citizens.” Minister Yamamoto was unable to give a clear response.